Beginners Welcome: Learn how to use the mind and body together to promote fitness and body awareness, as well as developing concentration and relaxation. If you want to find out more, and see what it is all about, come along any Friday at about 7.20pm to talk to a teacher and watch for a while. Private lessons also available, including sessions during the day. Email/phone for enquiries. 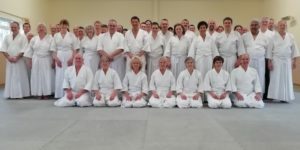 The club is run by Sensei Peter Hughes who has been practising in Plymouth under Sensei Williams since 1975. He took over the club in 1986 when he left the merchant navy. Graded 8th Dan in 2001, he is a member of the Executive Committee of the Ki Federation of Great Britain and teaches area and international courses.